Information and Communication Technology (ICT) has influenced every domain of human existence and has become pervasive with our day to day life. We have a persistent urge to remain online and wish to remain acquainted with the latest in the world at any point of time. This is a result of large amount of content generation for web resources by the educators, students, media personals, researchers, commercial entities, and many more. Also, the information browsing and retrieval by a varied number of users worldwide. Hence, the influence is both ways. It is on the content generators, as well as the content users. Education is an intrinsic part of the growth of the human race, and hence, cannot alienate from the impact of the tremendous growth in technology. 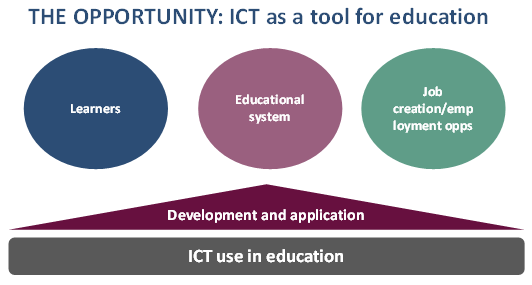 ICT is known to empower the educators and the learners to foster the development of the 21st century. It can play an instrumental role in the transformation of the teacher centric education philosophy to student centric learning philosophy. The clarity of expression, freedom of thoughts, creative aura, critical analysis that is promoted in today’s times can be strongly felicitated by various ICT based tools. It has also been largely advocated globally that ICT can promote learner autonomy. Hence, people can easily opt to get acquainted with other domain knowledge base. The easy access to information availability facilitates the learning aptitude in people and equips them with many modes of educating themselves. The reminiscence of my early education comes from a small school in a village, where the children used to carry their own gunny sacks and lay it on the floor to study in a class under the open sun, among green trees and windy environ. Little did we know those days that it would be possible to educate ourselves in virtual classrooms, in the large open world of information and telecommunication. The path breaking tools like the virtual classrooms, Massive Online Courses (MOOCs) are largely responsible for facilitating open and free education to a wide variety of people, right from housewives, to working professionals, to student from schools, colleges and universities. The issue has been recently addressed by our very own Prime Minister Shri Narendra Modi, who is an epitome for exhaustive usage of ICT for reaching to a large majority of people globally in a flash of a second. The “Learning should go on” mantra has become highly popular with the open mindedness of people and hence, there is a constant urge to learn and update their skills and excel in whatever field they would like to explore. The colleges particularly are encouraging a massive exposure to the MOOCs and ICT based tools like course website, blogs, etc. for a collaborative teaching-learning environment. Gone are the days, when you could propose an idea without worrying about its novelty. In today’s world, the novelty needs to be proved and therein comes the role of communication technology. Professional Social Networking sites like ResearchGate and LikedIn give an exposure to a wide variety of research going on in similar domains and hence narrowing down your scope of work has become a lot more feasible now. Also, the advent of blogging by teachers and Learning Management Systems have provided a larger reachability between students and the teaching community. Students these days do not like the rudimentary style of teaching. This is also because they are easily exposed to a lot of learning material freely available on the internet. So, it becomes all the more essential for teachers to adapt to and regularly keep themselves updated with the current trends and technologies in the market. In this era of social growth and awareness, anything spoken in the class is not just accepted as the golden words from teachers. Student critically analyse the knowledge imparted and need to be convinced about the concepts that are put across them in the class. The other day, I was going to teach a particular concept in Computer Networking and realised that this concept, although explained in the book has become almost obsolete in Networking domain. Hence, as a teacher, it is not feasible anymore to go and say in the class that “this is what is in the book”. This is not at all an expected doctrine in today’s times. Every time a new concept is taught, the teacher also gets acquainted with the latest in that field and accordingly shares the information in the class. In majority of the lab work assessments I prefer telling the students to access the internet or any other resource to solve the problem I give. And in spite of that, if they find it challenging to solve, then that’s my credibility as a teacher. This also doesn’t mean that I give them a problem to solve, which is not at all related to what I had taught them. No, then that’s again not assessment. So, with the given set of knowledge, that I had imparted, if I can frame questions, that they find challenging to solve, with all the resources available to them just a few clicks away, then that’s the challenge I like to face as a teacher. What I mean to say, by this is, teachers of today should keep in mind the amount of already available resources while teaching the students. This helps us to develop a stronger bond with the students and also in getting the due respect of our credibility in imparting knowledge to our progeny. I particularly believe in making a student independent to think, to analyse problems, to solve problems and finally conclude. I don’t wish to ever make them parrots that exactly speak the way they have been taught. 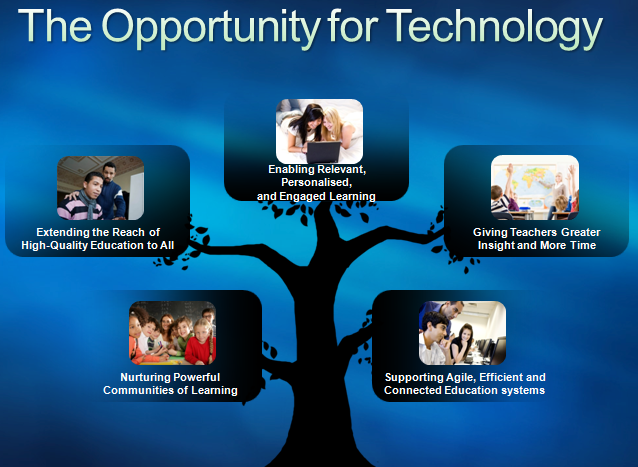 And, by accepting the role of ICT in the evolution of teaching learning process, greatly affects and emphasizes these goals. My teaching should be able to help a student to invent new paths on the dead ends of long roads. Google Apps as a campus collaboration tool on our University Campus greatly helped in bridging the gap between a student and a teacher. Students now-a-days come up with new ideas of information sharing via wireless access points, Virtual Private Networks. This does not essentially mean that, the students have become demanding, but rather it means that students have started playing active roles in the teaching learning process. They have also become entities or agents for sharing and imparting knowledge! Isn’t this required to make education a pleasurable experience? As long as “Leaning is fun”, it keeps getting innovative day by day. The moment learning only remains a decorum, it becomes bounded and curbs the growth of an individual. We, as teachers also don’t wish to inculcate directional growths in our students. We wish to make them develop as independent individuals and decide their own direction of growth. Even in schools, now-a-days, students browse the internet and compare the prospects of various professional fields, before deciding what stream they would like to choose. Of course the final decision may be only after discussion with their parents or guardians, but the students are well read to be a part of the decision taken related to their future prospects. Likewise, the students in colleges, even though are exposed to a wide range of online materials and collaborations; but the role of a teacher to guide them to choose what could be best for them remains indispensable. One of the best parts of an Indian Parenting and University Guidance is the role of the teacher as a guide and a mentor to stop the students from drowning in the whirlpool of information. And hence, a balance, harmony and cohesion between the uses of ICT in Education is appreciated. ← Faculty First: Do We Have a Choice?